St. Mark’s develops the habit of community involvement to awaken concern for those coping with hardship and to instill a lifelong commitment to service and advocacy. A meaningful program of mandatory community service will raise social awareness, develop the ability to communicate respectfully with all individuals, and teach sound leadership values and skills. St. Mark’s distinguishes between community service and charity by emphasizing the educational, person-to-person nature of community service. Such service enables our students to play a beneficial role in the Dallas community, as well as in agencies serving special needs within the city. Students acquire knowledge and deepen understanding of their community through presentation of experts, direct observation, and personal experience. Upper School students are required to complete 15 hours of service per year. A minimum of 10 hours is required for the first part of the year. The remaining five hours are required at the end of the second period. Middle School students will participate in a class project in the spring or the fall. Since the goal of the program is to foster empathy, develop an appreciation for a broad range of backgrounds and experiences, and to encourage students to step out of their traditional daily interactions, students will not receive community service credit hours for service at a private camp, church, synagogue, mosque, music/dance school, etc. unless they are directly involved in outreach through their organization. 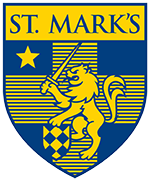 We encourage students to wear St. Mark’s apparel. Remember that you represent St. Mark’s when you are out in the community. Be an active participant and remember your actions are a direct reflection on our School. The Community Service Director and/or an Assistant will attend all major functions along with various faculty members from both schools. There will be some activities that will not be chaperoned by faculty but will be monitored through the agencies with whom the service is completed. Academic responsibilities always come first and should not be postponed in order to comply with students’ service hours. Enjoy what you are doing, and others will enjoy having you help. Remember that the benefit runs both ways: others will benefit from your help and you will benefit from your engagement by building on your leadership, communication, and decision-making skills. This will help you develop socially and academically by being able to integrate your learning experiences with practical knowledge. Service requirements to be fulfilled between September 1, 2018, and May 31, 2019. Grades 5–8: Participation in projects organized by the Middle School Community Service coordinators. Grades 9–12: Fifteen hours of service per year. The year is divided in two periods. A minimum of 10 hours is due by January 22, 2019. The remaining five hours are due by April 8, 2019. Students are reminded that community service is external to the School. Therefore, most service opportunities will occur after school hours or on weekends. Because the goal of this program is to open up new horizons, students may not receive community service credit for volunteering at St. Mark’s, a private camp, church, mosque, synagogue, temple, music/dance/riding school, sports clinics, etc. unless they are involved in service outreach through that organization (reaching those outside the organization membership and into the community such as the Brendan Court Program carried out at School after hours and during the summer). Eagle Scout projects may be used to claim service hours, but only the portion involving direct work with the beneficiaries of the project count. Planning, traveling hours, etc. do not count. Boys may recruit friends and classmates. Professional internship hours do not qualify as service hours, unless you are reaching out to a specific community. St. Mark’s is a certifying organization for the National President’s Service Award. The School orders awards for the students who qualify at the end of each school year. All hours count toward the award, including summer hours. Awards are given based on age category as determined by the organization. May 1 is the last day to submit hours for the Service Award. Some projects and events are shared with The Hockaday School. Both directors take turns to transport and chaperone shared projects and events. Entering the number of hours (the actual service hours at the event plus one hour for transportation). Assigning those hours to the 10-hour goal in January or 5-hour goal in April. Including an email from the agency that will be used to verify the hours served. Checking the “Honor Principle” box. Hours must be entered online and paper forms can be uploaded. University of Chile - B.A. Texas Tech University - B.S. University of North Texas - M.Ed. Christina joined The Office of Development & Alumni Relations in 2014 as Director of the St. Mark’s Fund and also currently serves as a Middle School Community Service Coordinator. She earned her B.S. in Human Development and Family Studies at Texas Tech University in 2005 and a M.Ed. in School Counseling from the University of North Texas. Prior to joining St. Mark’s, Christina served as the Director of Annual Giving at her alma mater, Bishop Lynch High School. During that time she worked closely on building relationships with parent and alumni donors and volunteers, and she also managed the school’s Auction. From 2005-2010 Christina worked for the American Cancer Society as a Community Manager supporting their signature event, Relay For Life. Christina and her husband, Nick, reside in Dallas with their son Brooks and black Labrador, Jack. Kurt joined St. Mark’s in 2012 and teaches middle and upper school computer science. He also coaches middle school basketball and JV lacrosse and serves as a Middle School Community Service Coordinator. Before coming to St. Mark’s he worked at independent day schools in Cincinnati and Connecticut. Kurt has many roles on campus outside the classroom and coaching including advisor, club sponsor and is also an active member of the wilderness program. A native of Cincinnati and graduate of St. Xavier High School, Kurt received a B.S. in Business from Miami University. He and his wife have two children.